Senior Jared Nave, 24, goes up for a shot between two Upperman defenders during Friday night's 8-AA showdown. Nave collected a double double with 23 points and 10 rebounds to lead the Lions to a 65-59 win. (CANDICE JONES photo). BAXTER - Who says it's lonely at the top? After spending the last three years looking up at other teams ahead of it in the District 8-AA standings, Cannon County's seniors are enjoying the view from the top after completing the regular-season sweep of perennial power Upperman, 65-59, in Baxter Friday. The Lions (16-7, 4-1) won their fifth straight game and moved into first place in the league standings at the halfway point with their second win against the Bees (13-8, 4-2) in the last five days. Cannon County's win was its first against Upperman in Baxter since 2001-02. "We still have a long way to go but I'm happy to be at the top at this point," senior Jared Nave said. "I was pretty confident we were going to win this game." Nave's play was a big reason the Lions were able to stare down adversity and secure the colossal road triumph. Cannon County was playing without senior starter Brian Cripps, who did not make the trip due to illness, and when Justin Davenport and Cody Ruehlen were saddled with foul trouble in the second half, it was the scintillating Nave who took his game to an even higher level. The 6-foot-4 power forward registered his 10th double double of the season, pouring in 23 points on 7-of-12 shooting, grabbing 10 rebounds, dishing out four assists and blocking four shots. He also drew two charges, raising his team-leading total to 12. Nave scored 19 of his 23 points in the game's final 13 minutes after Davenport and Ruehlen had collected their fourth fouls and was one of three Lions in double figures. Davenport led the team with 25 points on 7-of-15 shooting, including three 3-pointers, and Colin Jones added 11 points on the strength of three 3-pointers. "I never doubted our guys could win this game but our backs were against the wall in a tough district road game," Cannon County Head Coach Matt Rigsby said. "I am so proud of these guys. This was something we knew we could do but the way they had to do makes the win so much more impressive." While Davenport, Jones and Nave, were the chief offensive threats, the contributions of reserves T.J. Mitchell, Heath Simons, both seniors, and sophomore Jarrett Melton, can not go overlooked. Collectively, the trio combined for just six points, but it was the quality minutes, key rebounds, charges taken and steady play they provided off of the bench that also sparked the victory. "This was another team win," said Davenport, the team's leading scorer. "We knew we were going to win because we believe in what we are doing as a team. It feels great to be on top. We are in control of our destiny but we can't stop. We have to keep working and we can't be content. This is what we expect to do now. This what we are supposed to do." The game between 8-AA contenders was heavily contested throughout. There were four lead changes early and neither team led by more than eight, but after Cannon County grabbed a 22-21 lead with less than two minutes remaining in the first half it never trailed. Although the Lions had seized control, escaping Baxter with a win still wasn't easy. It became even more difficult when Davenport was whistled for his fourth foul with 4:34 remaining in the third quarter and the Lions leading 34-30. 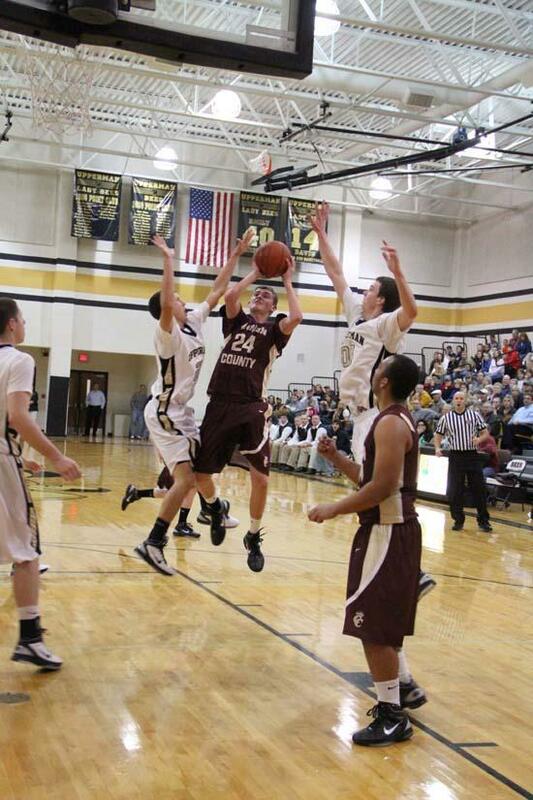 Seconds later, Ruehlen collected his fourth infraction and Upperman fans liked their chances. They forgot Nave was still on the court. He was an unstoppable force. Nave put the Lions on his back with the game on the line. He scored 13 points, grabbed six rebounds, took a charge and blocked a shot - in the fourth quarter alone. "My teammates told me to take over," Nave said. "They trust me so I tried to do my best." Though Cannon County led throughout the second half, things got hairy down the stretch when Upperman pulled to within 57-55 with 1:20 remaining and then regained possession following a Lions' turnover. Cannon County's defense forced a critical stop and Nave collected his 10th rebound with 51 seconds remaining. He was fouled and nailed both free throws to extend the lead to 59-55. The Lions led 62-59 after Mitchell converted one of two free throws with nine seconds remaining, and Upperman had a last-ditch effort to send the game to overtime. Nave blocked Daniel Taylor's 3-point attempt with two seconds remaining to seal the win. "Jared Nave continued to do what he has done all season and that's find a way to help his team win," Rigsby said. "I thought our team defense was solid and that also was a key to the win." Cannon County will look to maintain its 8-AA lead when it travels to Livingston Academy Monday. Go Lions! Keep it up! SO PROUD !!! GO JARED NAVE!!! THAT'S TEAM EFFORT..